The simple way to cleaner, healthier air at work. Perfect for any workplace, including … corporate offices, small warehouses, restaurants, studios, gyms, and MORE! Office Air Check is an advanced, accurate test that offers you detailed information about potentially harmful chemicals that may be lurking in your workplace air. Office Air Check is able to detect most major VOC’s, formaldehyde, active mold growth, and tobacco smoke. The Australia Department of Environment and Energy has declared that indoor air quality is a greater health hazard than outdoor air pollution, with pollutants being up to 100 times higher indoors than outdoors. Whether you know it or not, the air in your workplace can contain harmful chemicals from numerous sources that could make you feel sick or make asthma and other health conditions worse. Breathing unhealthy air at work can lead to decreased productivity due to illness and time off. Learn how to tackle indoor air quality problems so you and your coworkers can breathe safely. 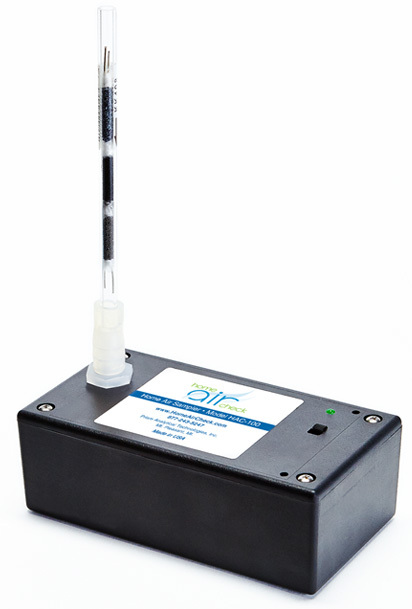 Office Air Check offers a professional-grade analysis at an affordable price, an easy-to-use test kit, a world-class laboratory, and an easy-to-understand report that provides actionable items to begin the process for cleaner, healthier air in your workplace. Collect office air sample(s) using one or more Office Air Check test kit(s) and send everything back to us in the postage-paid return box. Your sample is analyzed and we send you a report detailing the likely source of unwanted chemicals (VOCs) and/or tobacco smoke in your air. We also provide suggestions of what to do to improve your air quality. Enjoy peace of mind that you and your coworkers are breathing cleaner, healthier air at work! Ensure the indoor air quality remains healthy with regular testing. Active mould growth in your office can cause health problems and damage to materials. Formaldehyde, often found in pressed wood and particleboard used in new furniture and building materials also pose a health risk. This test analyses for the most likely causes of unhealthy air in your office by revealing levels of VOCs, the gasses emitted by mould, and it tests for levels of formaldehyde. Tests VOC levels as well as active mould.